← Just another super cool single mom. Have you seen the Seinfeld episode about the Sidler? The actual episode is called The Merv Griffin Show, and it’s definitely one of my all time favorites. In the episode, Elaine is faced with a new guy at work (actually played by my friend Brent Hinkley) who sidles up to her, unheard. She’s constantly on edge and going crazy…. I have a sidler too. When you’ve lived alone for as long as I have, you come to trust the silence. If there’s no sound, there’s nothing happening – you are safe and protected. You can let your guard down. When you live alone and you have a baby, nothing really changes as far as your silent alone time goes – you have a baby in a crib who can’t get out unless they cry or call for you. Then, one day, last summer, when I had an almost two and a half year old, I was writing at my table (writing a blog here, in fact) listening to the sounds of my own words in my head, the keys clicking on the key board and the ambient exhale of the air conditioning, alone, when something moved in my periphery, right under my elbow. In a split second I saw a smiling little tiny person and I screamed my head off. This only made him smile more, so proud that he had climbed out of his crib by himself, during precious nap time. My heart pounded. He’d scared the CRAP out of me! I HATE that kind of startle. I can’t imagine who likes it, though people do – that’s why they have Knott’s Scary Farm, which I went to one time in college on a double date and spent the whole night screaming in misery. I finally just closed my eyes and made my boyfriend guide me around so I wouldn’t see the ghouls jumping out at me. I hadn’t heard my son coming that day. I had a sidler. After lots and lots of tactics (you get a treat if you don’t climb out of the crib being the one that worked best,) Spenser stayed in his crib and I was able to trust my alone time again. 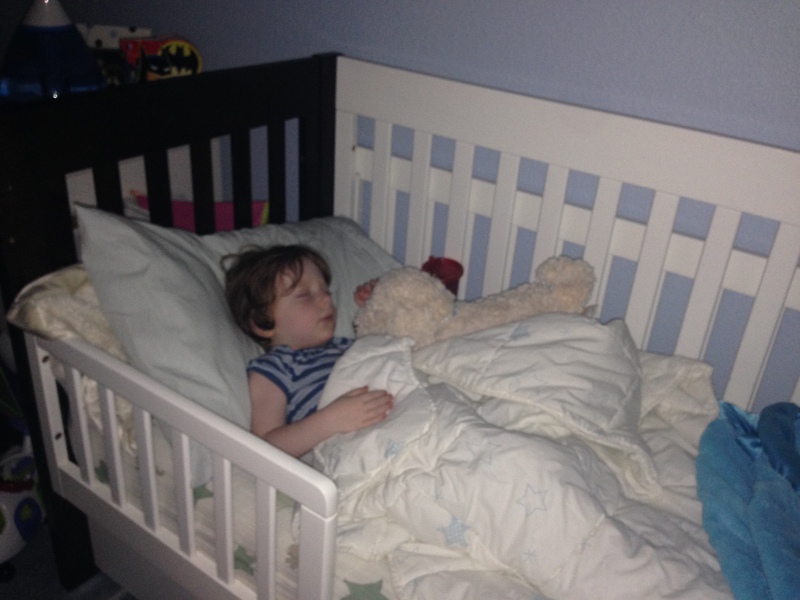 Then came the BIG BOY BED! I know the first reaction is: put up a baby gate! S’s room is a converted dining room, so it has a door and then a huge opening into the living room. I priced large, custom baby gates and they are expensive. Also, I know that I won’t need them for long…. but most importantly, the thought of him feeling like he’s trapped in his room makes me a little sad. I guess I’d rather lose sleep. And the truth is, he will probably sidle up to my bed until he goes to college. I know I woke my parents all the time for things – feeling sick, nightmares, I heard a noise etc. And speaking of losing sleep – Every night now, I go to bed, exhausted from the long day, ready for a great 8 hours of slumber and I lie there – awake, anticipating my sidler at my bedside any second. I’ve often jolted up, thinking I heard him, when he was actually sound asleep. The first night of sleeping in the big boy bed, he did indeed scare the crap out of me when he sidled up to my bed and woke me. So now, no matter how tired I am or how early I go to sleep, I toss and turn until the sidler sidles up to my bed. Usually between 1am and 2am. I know like all phases of motherhood/childhood, this one will pass. Either I will get comfortable with being awaken in my sleep or S will just sleep through the night again. Hopefully both. Or I can always put a pack of tic tacs in his jammies. This entry was posted in MOM STUFF, SOLO STUFF and tagged big boy bed, mom solo, single mom by choice, the sidler. Bookmark the permalink.